If you’ve ever wondered what it would be like to work at No. 10 Downing Street, read on. In March 2015 students from across the University were eligible to apply to take part in the ‘Behind the Black Door Competition’ – an event designed by the Careers Service and in collaboration with Alex Aiken (Executive Director, Government Communications) following his guest lecture at the University in November 2014. The prize for winning the competition was a day in Westminster, featuring a tour of No.10 itself. After a review of all the submissions, 25 students were selected to take part, forming five teams of five for the competition day itself. 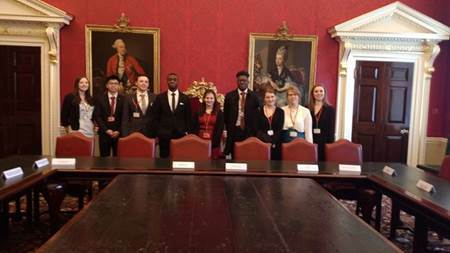 After much deliberation on the day of the competition, the judges selected two teams as joint winners, the prize being the aforementioned visit to the Cabinet Office and No 10 Downing Street – and the opportunity to meet with Senior Civil Servants across a variety of Communications roles. Given my involvement in setting up the competition (and nothing to do with my own personal motivations to see inside No.10!) I accompanied the ten students on the day. After fitting the students with harnesses and high-visibility jackets for safety we began the day at 70 Whitehall, home of the Cabinet Office. Here we met Alex and he gave us a summary of the day and the people we would meet. This meeting took place in COBRA, which I learnt actually stands for ‘Cabinet Office Briefing Room A’. The picture below shows the students in here, and it is around this table that the current coalition deal was struck. The first person we heard from on the day was Arthur Leathley, a veteran of newspaper journalism and at that point in time the man leading cross Government communications. The main focus of the conversation was on the Government’s handling of communications relating to the Ebola outbreak in West Africa. The conversation drifted to the wider responsibilities of the Government in regards to what they should inform the public of, and how they should work with the media, which provoked a lively debate between the students present! After meeting Arthur the group headed over to Public Health England to meet the marketing team there, and the person behind the Government’s Change4Life campaign. Caroline Fox gave a very insightful talk on how the Government communicates health issues to the general public, how they target their messages and how they aim to get maximum engagement. She remarked how it’s hard to get people to quit smoking or other bad habits, as they think the end result is further away than it perhaps really is. This avoidance of the inevitable struck a chord with me, as we (the Careers Service) are repeatedly trying to talk to students about doing something now with their career, rather than waiting for the inevitable end of their degree – as by this time it may well be too late for some routes. I’m by no means saying that those students who don’t engage with their careers earlier on are just as bad as smokers! However, I think it’s an interesting point about how do you engage (any) audience with a topic which has an event horizon that can seem so far away that it doesn’t matter yet. It was then time for lunch, and the students were able to meet recent joiners to the Communications Department – and it was very interesting to hear about their various paths to their current roles. For some it was straight out of University, for others it was after several roles in other organisations that you wouldn’t think applied. In summary, the message was that the Government are looking for the right skills rather than a certain trodden path – and so they employ people of all backgrounds and experiences. The next stop on the tour was the Ministry of Defence – described by our guide as nothing more than an office block, albeit with some interesting history attached to it! He wasn’t far wrong, and as a building, its insides are largely functional rather than inspirational. We did go down several staircases to the oldest surviving part of Henry VIII’s Whitehall Palace (the street that is now Whitehall ran right through the palace at the time). This relic was in fact the old wine cellar for the palace, and is sometimes still used today as a venue for parties and gatherings. We were lucky enough to hear from the Head of Public Relations for the Ministry of Defence, James Shelley – a man with a lot of character and the burden of maintaining the image of the armed forces. He spoke largely about the logistics of his role, the timings of key events, the various stakeholders involved, and how all this comes together in their public relations strategy. 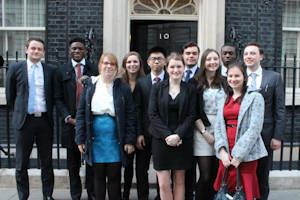 The last leg of the tour was the visit to Downing Street itself. We crossed the road from the Ministry of Defence and were ushered through the gates and onto Downing Street, much to the envy of the tourists who are only able to hover at the gates and attempt to get pictures of No.10 via a long lens camera. One can only assume that they thought I was a celebrity of some sort, as I smiled for the paparazzi and passed through the security gates. As you’d expect, the street itself is pristine, and the feeling of walking down it was akin to being on a film set. You felt a certain privilege and excitement at being able to walk down such a historic road, perhaps even more so as it’s not open to the general public any more. After a couple of snaps outside the famous black door we went inside No. 10. Again, you’re very aware of the history and significance of the place, and can only imagine what conversations and decisions have been taken inside of these walls. The current Head of News for No.10 is a Manchester alum, Nicola Hudson, and we were fortunate enough to hear from her about her role. Her job has to run like clockwork, but it’s a clock that can be smashed at any point by a breaking news story. Nicola’s path to press royalty was as varied as the other stories that we’d heard throughout the day – and was again a repeat of needing the right skills rather than very literal experience in a certain industry. After Nicola’s talk we were given a tour of No.10 by Alex Aiken. It was evident that David Cameron was ‘at home’ as there were advisors scurrying in and out of one of the state rooms. The students were keen to meet the Prime Minister, but that wasn’t to be, as I’m sure he had more important matters to attend to – you would hope! The students and myself all felt very fortunate to be able to tour No.10 (and No.11) Downing Street – there is a quiet buzz about the place, with meetings and conversations taking place across the buildings, both in rooms and corridors, and whilst moving along to other meetings. Whilst some of these conversations might be about small matters, or very significant ones, you left with the sense that Government is active all the time, whether that be firefighting or policy and strategy making.